There is nothing quite like a good shot of espresso, especially during those sleepy mornings. It never fails to give you a much-needed jolt to get you ready for the day, and don’t get me started on that beautiful aroma. Quite frankly, I wouldn’t mind my entire house smelling so good. Imagine how much work you could get done if your house smelt like a Roman café. Nothing beats the experience of drinking a shot of espresso in a quaint Italian café, where you can sip your coffee, read a newspaper, and avoid eye contact with those snooty Italians, who look at you judgmentally because you don't know how to drink espresso properly. But, of course, not all of us can afford that great experience. Instead, we would love to get a shot of our morning elixir anytime we want. Whether it's in our homes or our workplaces, a good espresso livens up the place and helps us to get a lot of work done. It's a good thing we have these little wonderful things called espresso machines. These range from small tabletop variants to really large industrial types. One drawback is that they usually cost an arm and a leg, but here are a few hidden gems around that are still affordable. So if you are looking for a great machine that does not set your wallet back too much then you are in luck because we have made a list just for you. And for those of you who do not want to break the bank, all the products on this list will be under 200 US dollars. Did you know that espresso is not the coffee bean or blend? It is instead the method of preparing your coffee. Basically, the coffee blend (fine ground) is brewed by forcing high-pressure water through it to make a very intense and concentrated coffee product. A true espresso has cream on top. The popularity of coffee shops around the world has given the notion that espresso is dark, bitter, and packed with caffeine. This is not exactly true, as most coffee experts around the world love to point out. One of the huge issues I have with the new wave of coffee shops is that they make espressos with 18 to 20 grammes of coffee. Basically, they give you two to three times the caffeine of a traditional espresso, and in that small dose of liquid… the ratio of caffeine per ounce is incredibly high and makes the coffee over extracted and bitter. So there you go, when an Italian tells you something about Espresso, you better listen. An espresso is meant to be consumed quickly. That is the reason why the cream is placed on top. It is said that you have to finish the espresso before the cream starts to thin out, like a delicious timer for your coffee. So you can have a small pastry, some chit-chat, and a quick shot of espresso and then be off on your caffeine-induced way. That's a pretty sly way to get the line moving if you ask me. Ristretto - Many coffee lovers around the world know this as the true espresso. It is actually the first ¾ ounce shot of the initial extraction from the coffee blend. It is also called the “short shot”. Single shot - This is the same as the Ristretto, but this time it uses 1-ounce of the high-pressured filtered blend. Lungo - Same as the Ristretto, but this time it uses 1 ½ ounce of the high-pressured filtered blend. Double Shot - This is like a double Ristretto, but unlike the single shot and the Lungo, it uses twice the coffee blend to make 2 ounces of espresso that retains the intensity of the Ristretto. Espresso Machiatto - Simply put it is an espresso with added milk foam on top. Café Breve - This is an espresso but with light cream on top. Espresso con panna - This is an espresso but with whipped cream on top. Cappucino - Bet you did not know this one; cappuccino is just an espresso with frothy steamed milk on top. Café Latte - This is an espresso but with 8 inches of steamed milk on top. Café Americano - This is basically an espresso with 8 ounces of hot water to tone down its intensity. Switch the machine on. Wait for light to stop blinking (about 25 second). 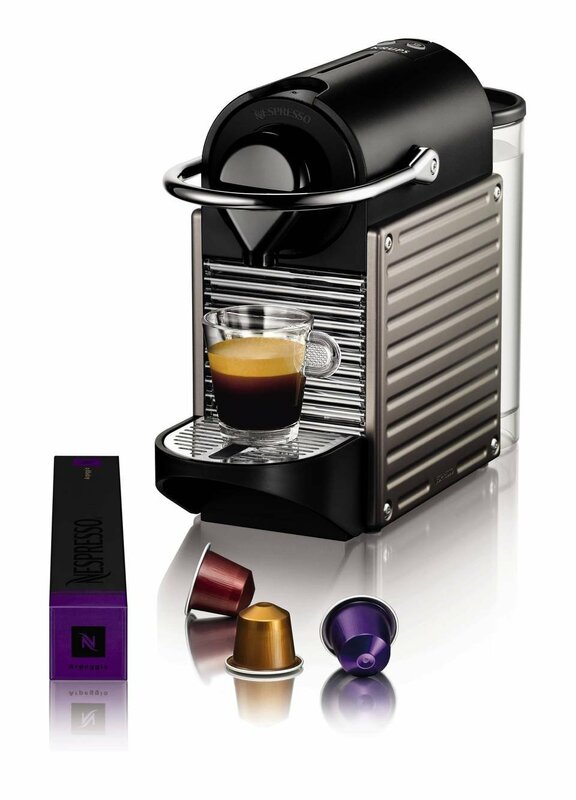 Lift lever and insert a Nespresso capsule. Place your cup under the coffee outlet. Press desired coffee button. Done. It is that simple and that fast; you will get a shot of espresso in less than 30 seconds. It also comes with a nifty 9-minute turn off mode for added convenience. It's as if the makers of this wonderful machine don’t want you to lift a finger. It is only a single cup though, so you will have to prepare another batch if you are having someone around for coffee. It is also very compact and quite light. This machine comes with an empty water tank detector to alert you when you need to refill it. It comes in three color which are Pixie carmine, Pixie steel, and Pixie electric titan; more than enough choices to match your machine to your kitchen décor. But let's be honest, they could change the name of this machine to espresso maker for lazy people and I would not mind it. Pods are not as good as fresh coffee grounds. What is amazing about this is that it is even cheaper than the Pixie Espresso Maker while looking just as good. It even has six different color variants to choose from to make this small wonder a perfect fit to your kitchen (Titan, Ruby Red, Silver, Pure White, Vanilla Cream and Intense Black). The Nespresso Inissia Espresso Maker is also slightly smaller and just as light as the Pixie and switches to off mode after 9 minutes. The main difference between the two is that the water tank indicator alert and the premium material used in the Pixie. If you want something that is quick, compact, and pretty to look at, then this might be the espresso maker for you. No empty water tank indicator. With the famous espresso purveyor Lavazza teaming up with Keurig to make their Classico coffee pods, you can be assured that will get a great cup of espresso. This baby uses 15 bars of pressure to brew your cup in under one minute, so you will definitely know that you are getting an intense cup of joe. The Keurig Rivo Cappuccino and Latte System also comes with an energy saving mode that turns the product off when it is not in use. When it comes to espressos, the machine has two size options, which are 1.4 oz. and 2.8 oz. It is not as compact as the first two espresso makers on the list, however, so it would take up some space in your kitchen. It has dishwasher-safe parts for convenient clean up. This is a great feature, as coffee is really hard to clean off a machine. So, if you like both the quickness and convenience of coffee pods, but want a better tasting espresso, then you should definitely check this machine out. Convenient coffee pods that taste better than others. Milk frother with 3 modes. Can make cappuccinos and lattes. Pods are not as good as freshly ground coffee. Getting espresso that is of coffee house quality isn't exactly easy. No matter how convenient and fast the coffee pods are, it still won't be up to par with the cafés in your neighborhood. 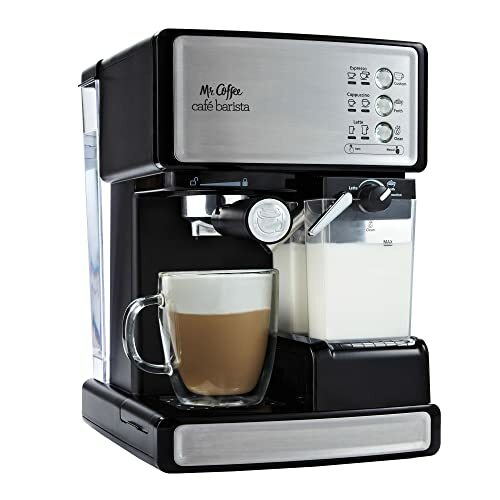 One espresso machine that makes a great effort is the Mr. Coffee Café Barista Premium Espresso/Cappucino System. The design is not exceptional, but its decent looking and will look nice with your décor. It won’t be a centerpiece, but it won't be an eyesore either. For a machine that can make a true espresso it is not that large, you could fit it quite nicely on your counter and shelves. The Café Barista has a portafilter where you load the ground coffee; this is attached to the metal handle, which is locked quite securely at the bottom of the spout. 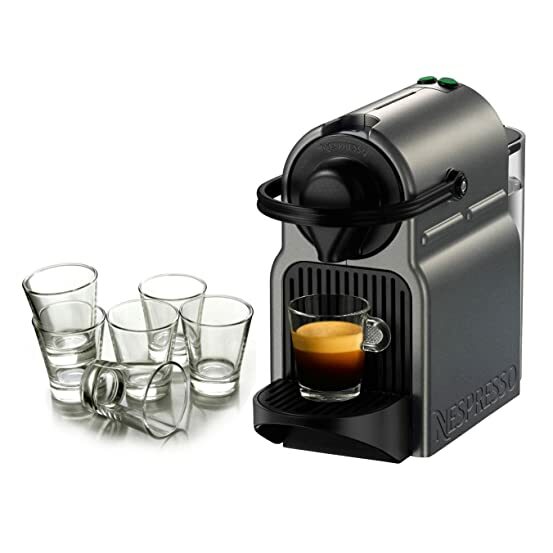 Its semi-automatic modes are 3-1 espresso, cappuccino, and latte, and they are done with a simple touch of a button. The milk frother is pretty amazing too. You can manually do it but I suggest you let the machine guess the level of frothing. All in all, the Mr. Coffee Café Barista Premium Espresso/Cappuccino System does an amazing job in giving you a good version of what espresso tastes like. And at its current price, it packs a mean punch. Quite compact for an espresso maker with milk frother. Makes great cappuccino and lattes. Portafilter makes decent espresso using freshly ground coffee. Good price for a decent espresso machine. The espresso's quality is better than pods, but not as good as the De’Longhi model on the list. I know what you are thinking, I must be crazy to look for a luxury espresso machine that's under 200 US dollars. 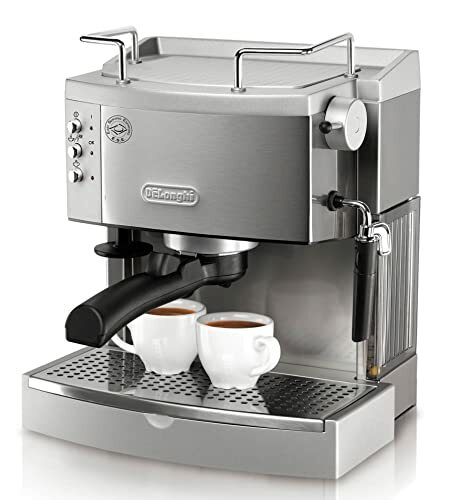 But hear me out first as I'm going to tell you about the De’Longhi EC702 15-Bar-Pump Espresso Maker. One look at this beauty and you will be sure your kitchen's going to gain more elegance. The stainless steel finish is always a welcome addition to any kitchen. 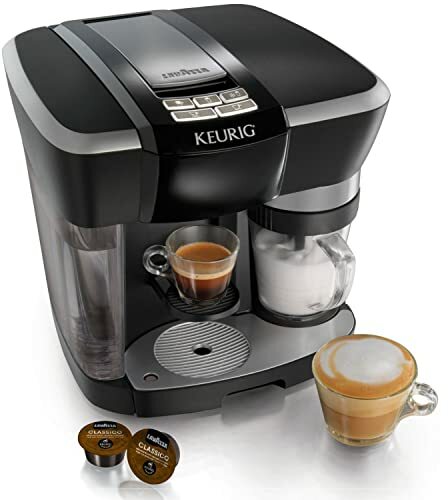 This machine’s versatility is amazing as you can choose fresh ground coffee or E.S.E pods with its dual-purpose filter. It also has a patented Sempra Crema that produces the perfect cream for your cup. The manual frother helps you to have that perfect blend of steam and milk for that barista quality creamy froth. It also has a warming tray on top to keep your cups ready for anytime that you need to get going. With a 15-bar pump system, you know that you're getting one intense roast every time you use this machine. This beauty is worth the investment if you take your espresso drinking seriously. Makes the best espresso out of all the machines on the list. The patented Sempra Crema system makes great cream for that true espresso. Higher price than the others on this list. Does not have an automatic milk frother. So there you have it, the best espresso machines for less than 200 USD dollars. You with be hard pressed to find better espresso machines than the five we have selected. But always remember to use high quality coffee beans when using the machines that require ground coffee. A good espresso machine is only as good as its beans. If you have any comments or stories regarding this topic, please feel free to write them in the section below. There’s nothing in this world that excites me more other than cooking. From appetizers to desserts, since then, I’ve always been passionate on making foods. Can You Freeze Coffee Creamer To Extend Its Shelf Life? Searching For The Best Coffee Scale? Here Are The Options! White Coffee: What Is This Delightful Beverage? Coffee Lovers, Here Are The Best Espresso Beans You Can Try! Best Commercial Espresso Machines With The Highest Marks!